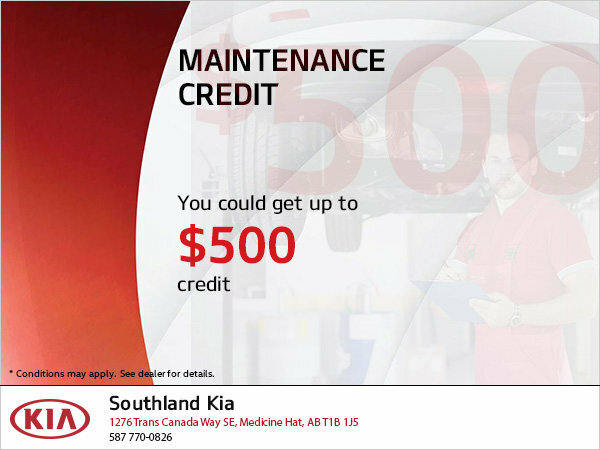 Come to Southland Kia today and take advantage of the $500 Maintenance Credit. Thinking about upgrading your Kia to a newer model? As a current Kia owner, you can drive away with the all-new 2018 Kia Rio today with even more benefits! As a current Kia owner, enjoy $500 in maintenance credits on your Member Rewards card when you buy or lease a 2018 Kia Rio. Use them anytime in our parts and service department! This sporty new compact is fun to drive and incredibly rewarding. It’s just one more great benefit of being a part of the Kia Canada Member Rewards Program. * $500 Maintenance offer available on the purchase/lease/finance of new 2018 Kia Rio5 models and is awarded in the form of a preloaded Kia Member Rewards card valued at $500. Some conditions apply. See your Kia dealer for complete details.